A book to cover developments in corrosion inhibitors is long overdue. 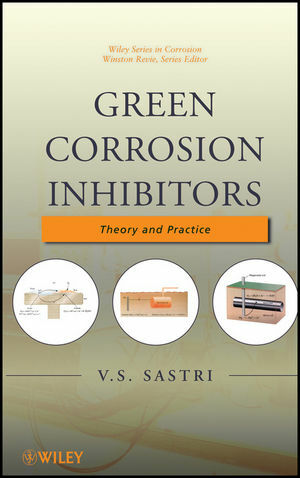 This has been addressed by Dr Sastri in a book which presents fundamental aspects of corrosion inhibition, historical developments and the industrial applications of inhibitors. The book deals with the electrochemical principles and chemical aspects of corrosion inhibition, such as stability of metal complexes, the Hammett equation, hard and soft acid and base principle, quantum chemical aspects and Hansch' s model and also with the various surface analysis techniques, e.g. XPS, Auger, SIMS and Raman spectroscopy, that are used in industry for corrosion inhibition. The applications of corrosion inhibition are wide ranging. Examples given in this book include: oil and gas wells, petrochemical plants, steel reinforced cement, water cooling systems, and many more. The final chapters discuss economic and environmental considerations which are now of prime importance. The book is written for researchers in academia and industry, practicing corrosion engineers and students of materials science, engineering and applied chemistry. V. S. Vedula Sastri, PhD, has over thirty-five years of experience in corrosion and chemical processes. Since 1994, he has been a consultant for Sai Ram Consultants. Dr. Sastri has written five books, approximately 150 papers in scientific journals, and has edited proceedings for five international conferences of the Metallurgical Society of CIM. 1 Introduction and Forms of Corrosion. 1.2 Developments in Corrosion Science. 1.3 Development of Some Corrosion-Related Phenomena. 1.5 Safety and Environmental Considerations. 1.6.5 Dealloying or Selective Leaching. 2 Electrochemical Principles and Corrosion Monitoring. 2.2 Nature of Corrosion Reactions. 2.6 Monitoring Corrosion and Effectiveness of Corrosion Inhibitors. 2.6.1 Objectives of Corrosion Monitoring. 2.6.2 Corrosion Monitoring Probe Location. 2.6.3 Probe Type and its Selection. 2.6.4 Direct Intrusive Corrosion Monitoring Techniques. 2.6.4.3 Inductive Resistance Probes (22). 2.6.5.4 Remote Field Eddy Current Technique. 2.6.5.6 Thin-Layer Activation and Gamma Radiography. 2.6.6 Indirect On-Line Measurement Techniques. 2.6.6.3 On-Line Water Chemistry Parameters. 2.6.8 Indirect Off-Line Measurement Techniques. 2.6.8.1 Off-Line Water Chemistry Parameters. 2.6.8.1.3 Concentration of Dissolved Solids. 2.6.8.1.8 Filming Corrosion Inhibitor Residual. 2.6.8.1.9 Reactant Corrosion Inhibitor Residual. 2.6.8.1.10 Chemical Analysis of Process Samples. 2.6.8.1.14 Salt Content of Crude Oil. 3 Adsorption in Corrosion Inhibition. 3.1 Adsorption of Inhibitor at the Metal Surface. 3.4 Anodic Dissolution and Adsorption. 3.4.1 Formation of Passive Films. 3.5 Role of Oxyanions (Passivation) in Corrosion Inhibition. 3.6 Inhibition of Localized Corrosion. 3.7 Adsorption of Halide Ions. 3.8 Influence of Environmental Factors. 3.11 Inhibition of Localized Corrosion. 4 Corrosion Inhibition: Theory and Practice. 4.1 Factors Pertaining to Metal Samples. 4.4 Processing with Acid Solutions. 4.5 Corrosion Problems in the Oil Industry. 4.6 Corrosion Inhibition of Reinforcing Steel in Concrete. 4.7 Corrosion Inhibition in Coal–Water Slurry Pipelines. 4.8 Corrosion Inhibition in the Mining Industry. 5.2 Structure of the Inhibitor. 5.2.1 Stability Constants of Zinc–Triazole Complexes (15). 5.4.1 Application of Hard and Soft Acid and Base Principle in Corrosion Inhibition. 5.5 Inhibitor Field Theory of Corrosion Inhibition. 5.6 Application to Typical Metal–Inhibitor Systems. 5.8 Influence of Inhibitors on Corrosion Reactions in Acid Media. 5.9 Corrosion Inhibition in Neutral Solutions. 5.10 Corrosion Inhibition of Iron: Interphase and Intraphase Inhibition. 5.12 Interaction of Anions with Oxide Films. 6 Industrial Applications of Corrosion Inhibition. 6.1 Corrosion Inhibition of Reinforcing Steel in Concrete. 6.2 Corrosion Inhibition in Coal-Water Slurries. 6.3 Corrosion Inhibition in Cooling Water Systems. 6.4 Molybdate Inhibitor in Corrosion Inhibition. 6.5 Corrosion Inhibition in Acid Solutions. 6.7 Inhibition of Corrosion by Organic Coatings. 6.8 Mechanism of Protection by Tannins. 6.9 Corrosion Inhibition of Titanium and Zirconium in Acid Media. 6.10 Corrosion Resistance of Several Metals and Alloys. 7 Environmentally Friendly Corrosion Inhibitors. 7.2 Summary of PARCOM Guidelines. 7.2.1 Toxicity: As Measured on Full Formulation. 7.3 Macrocyclic Compounds in Corrosion Inhibition. 7.5 Role of Rare Earth Compounds in Replacing Chromate Inhibitors. 7.6 Oleochemicals as Corrosion Inhibitors. 7.7 Hybrid Coatings and Corrosion Inhibitors. 7.8 Barbiturates as Green Corrosion Inhibitors. 7.9 Corrosion Prevention of Copper Using Ultrathin Organic Monolayers. 7.10 Corrosion of Titanium Biomaterials. 7.11 Corrosion Control in the Electronics Industry.